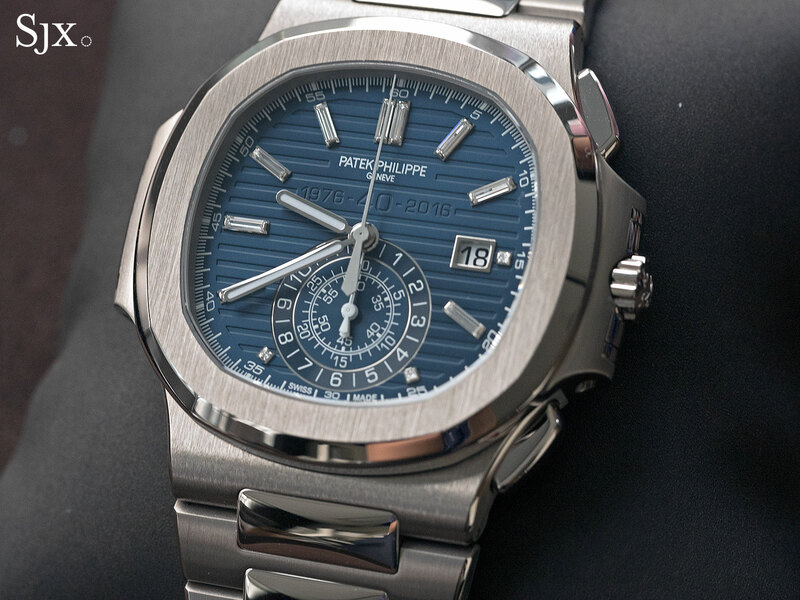 Patek Philippe's commemorative Nautilus editions raised many an eyebrow at launch, but how does it look in the metal? Read on. 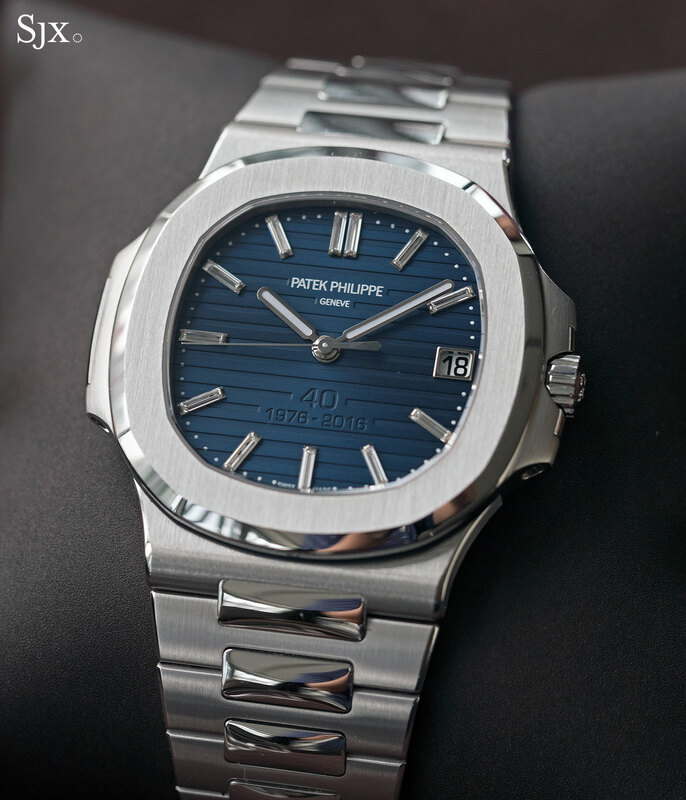 Patek Philippe unveiled the Nautilus 40th Anniversary limited editions – the Nautilus Ref. 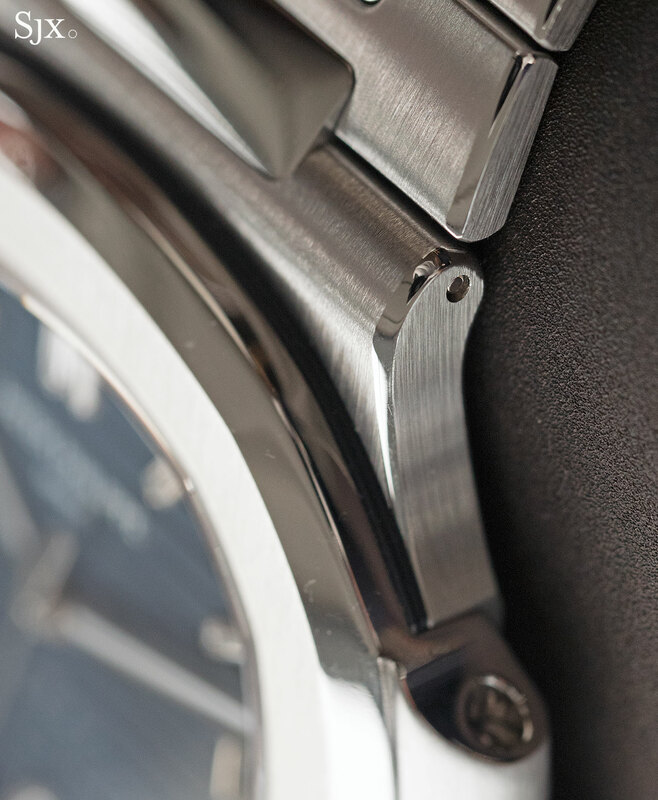 5711/1P and the Nautilus Chronograph Ref. 5976/1G – two weeks ago. 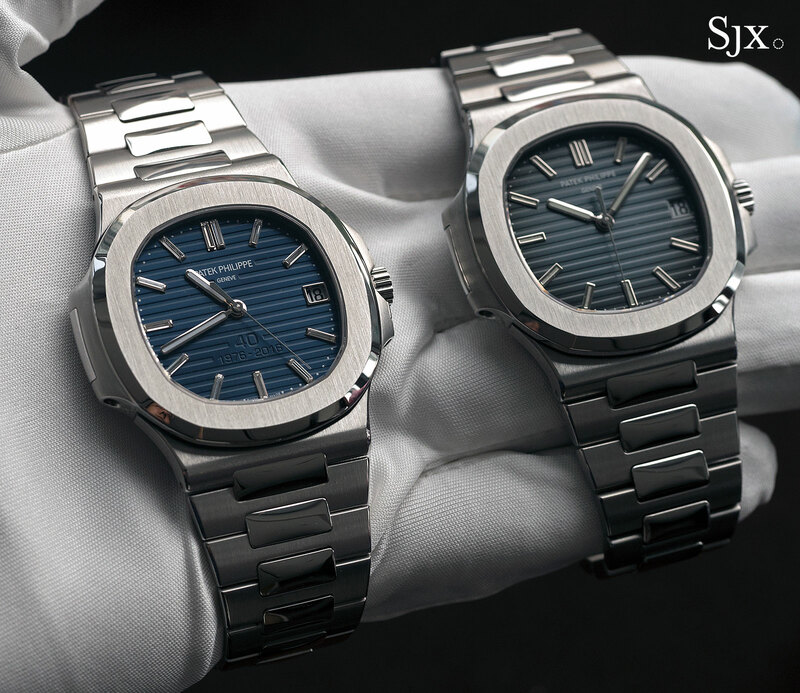 Most expected the anniversary to be a major occasion, but instead it was subdued while the response to the watches ranged from lukewarm to confused. The watches, however, deserve better. They look and feel much better, really much better, in real life. 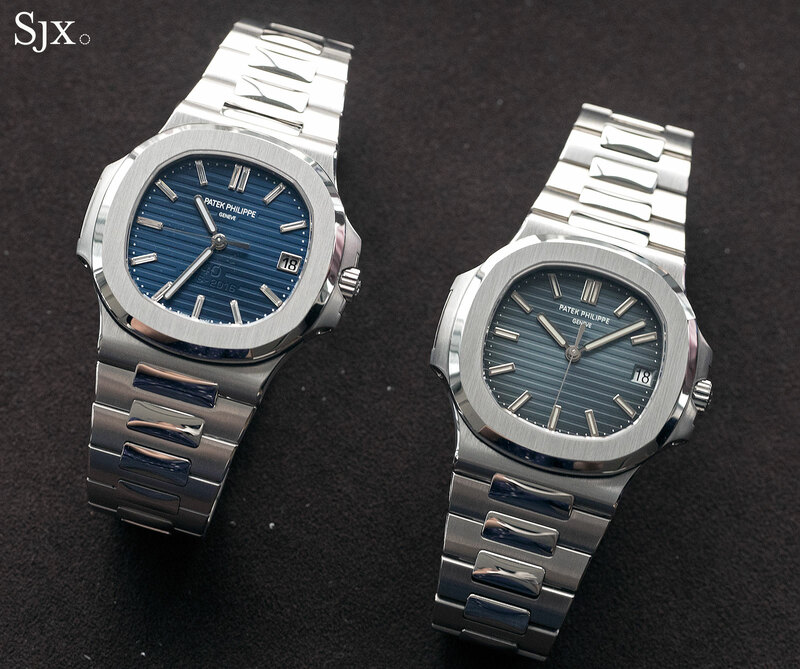 Launched in 1976, the Nautilus took a while to become the bestseller that it is, only really taking off a decade ago when the “Jumbo” sized ref. 3712 and then ref. 5711 were launched. Now it’s one of the definitive luxury sports watches, alongside the Audemars Piguet Royal Oak, which was also designed by Gerald Genta. So the 40th anniversary of the Nautilus is a big deal, and much was expected. 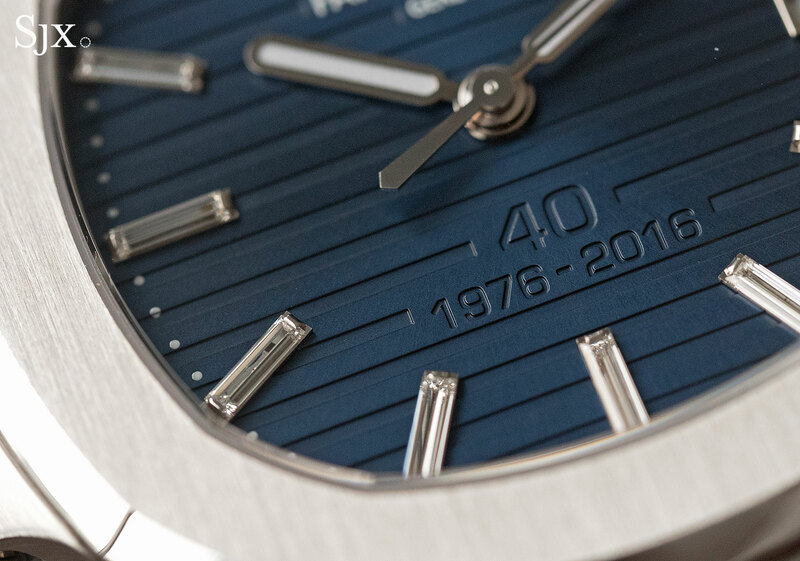 When the pair of 40th anniversary limited editions were finally unveiled a few weeks ago, the reaction was decidedly mixed. 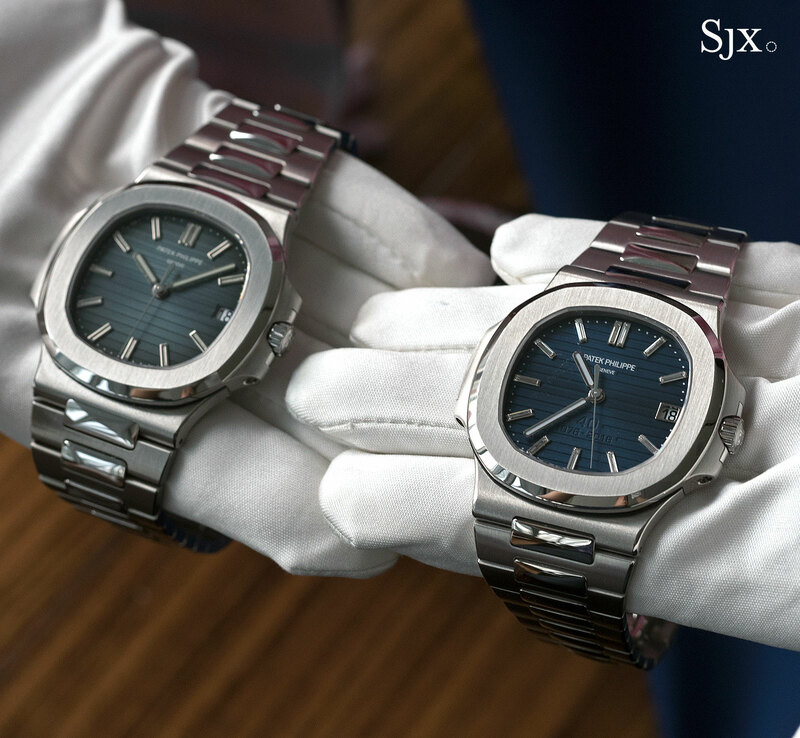 Many panned the design of the anniversary editions, especially the seemingly enormous commemorative lettering on the dial. The good news is twofold. 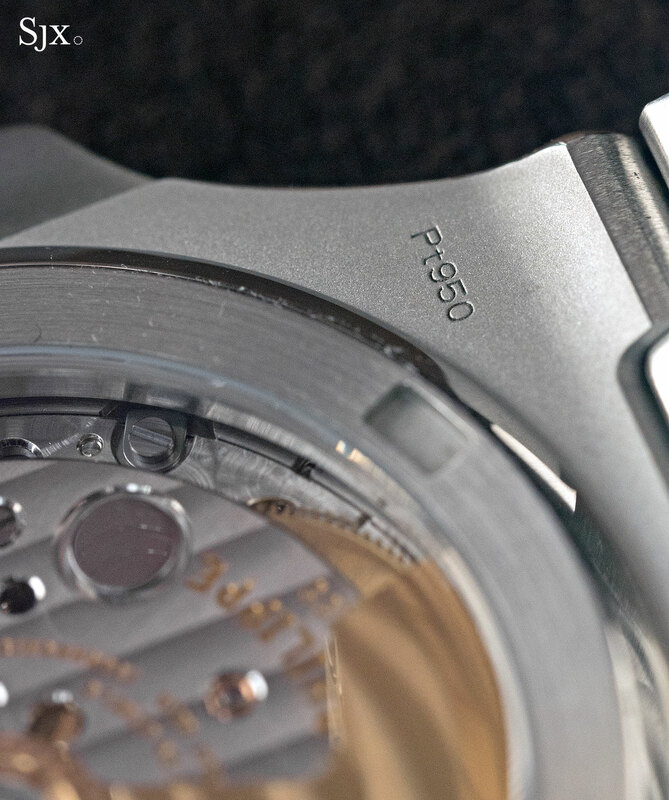 First, the lettering blends into the dial in real life and hardly stands out when the watch is on the wrist. 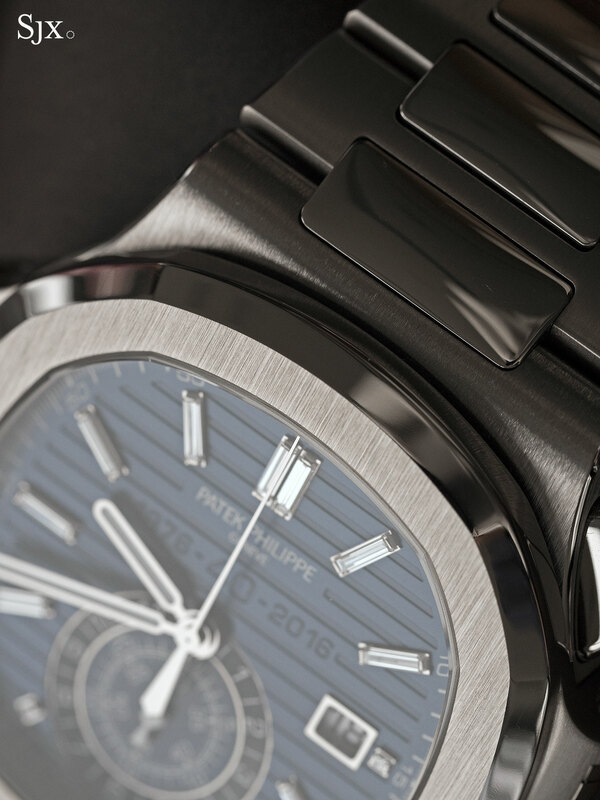 And second, to address the other key criticism, the Nautilus Chronograph ref. 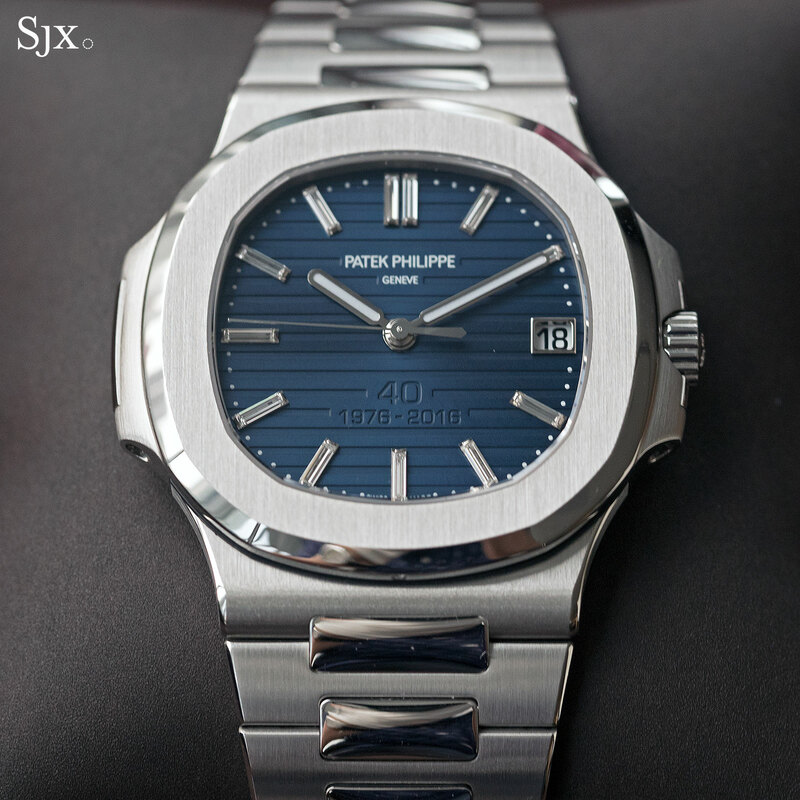 5976/1G is large for a Patek Philippe but not Brobdingnagian, especially compared to everything else in its class. Continue reading for a more detailed perspective on the pair. Arguably the more appealing of the two, the Nautilus Ref. 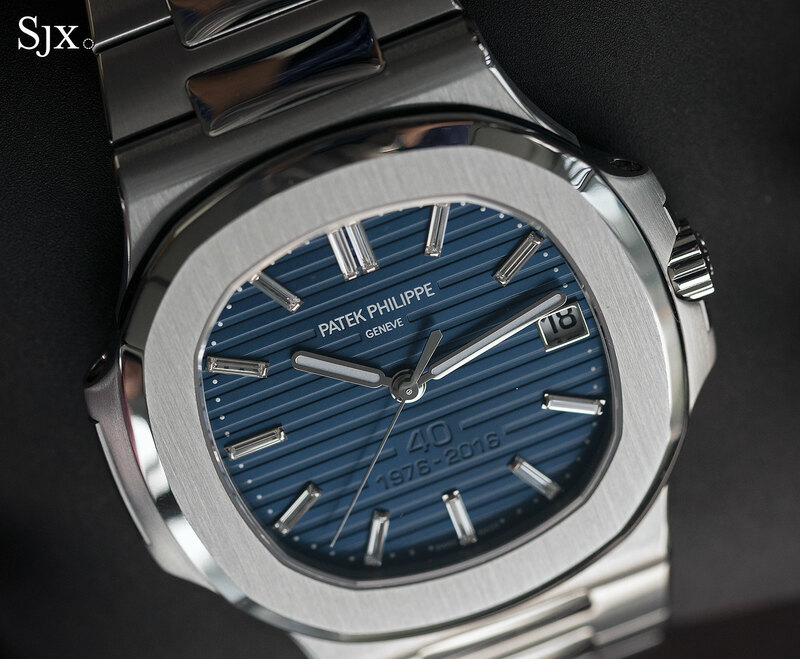 5711/1P-001 40th Anniversary Limited Edition is a magnificent product with a a wonderful tactile feel. But it’s weighed down, not by the platinum case, but by the stupendous and slightly absurd price of SFr100,000 (or about US$101,000). Sized exactly the same as the stainless steel Nautilus ref. 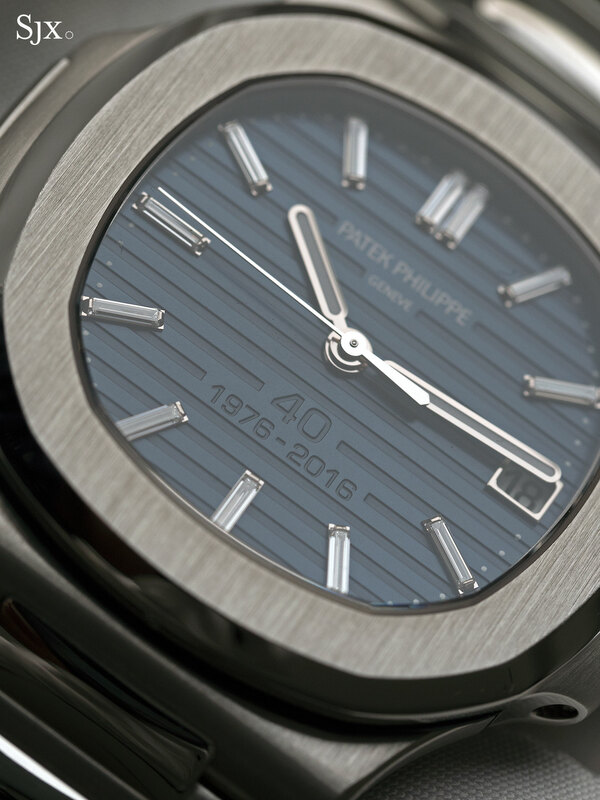 5711/1A – which means it’s 40mm diagonally from bezel edge to edge – the anniversary edition is entirely platinum, case and bracelet. Even at a distance the carefully finished surfaces and precise edges are obvious. 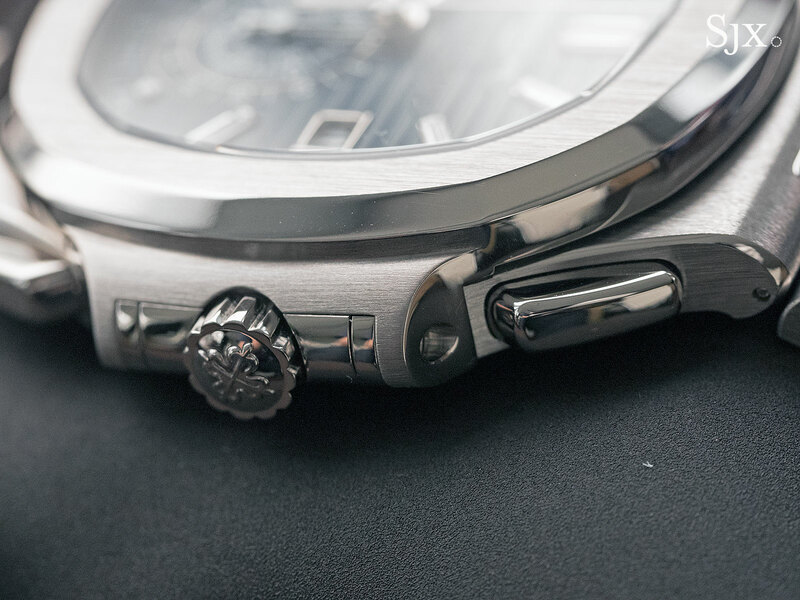 This case finishing is also apparent on the stainless steel Nautilus, but the anniversary edition is gleamingly white because of the platinum alloy. 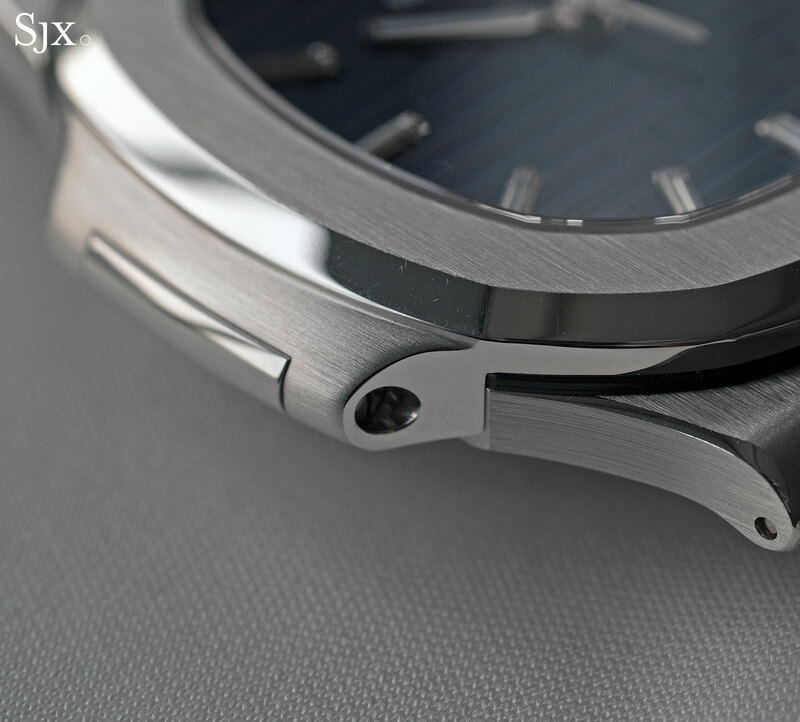 The density of the metal means the watch feels compact, solid and as expensive as it actually is. 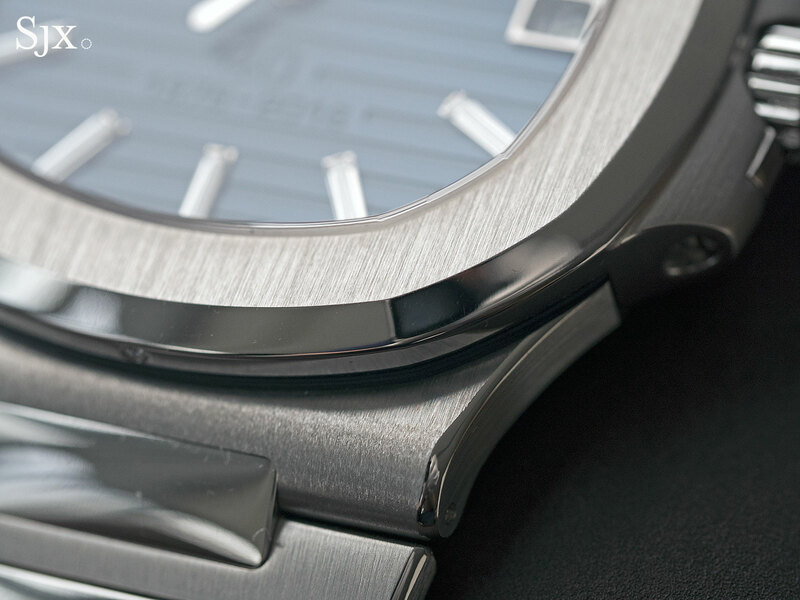 But the platinum Nautilus suffers from the same weakness as the stainless steel model, a friction-fit, double fold clasp with a stamped metal safety latch that feels out of place on a watch this finely made. 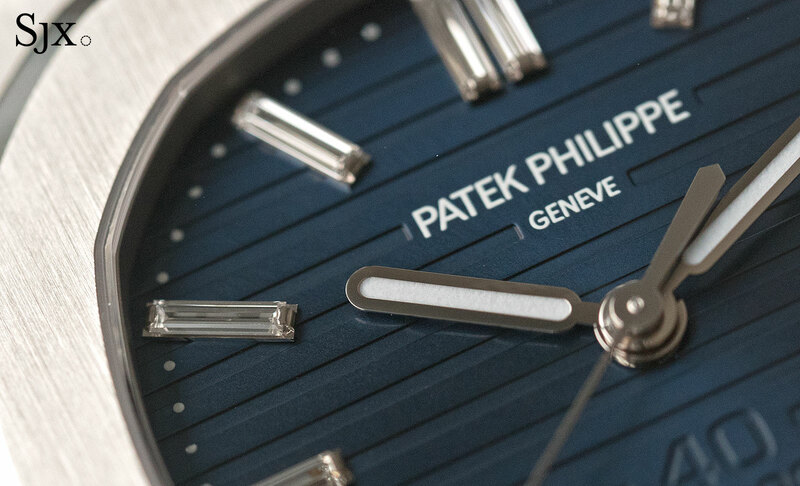 A bright, metallic blue that is a recognisably different from the graduated grey-blue of the steel version, the dial on the anniversary model is attractive, even with the widely disliked commemorative lettering on the dial. The anniversary text is stamped deeply, but not prominent. 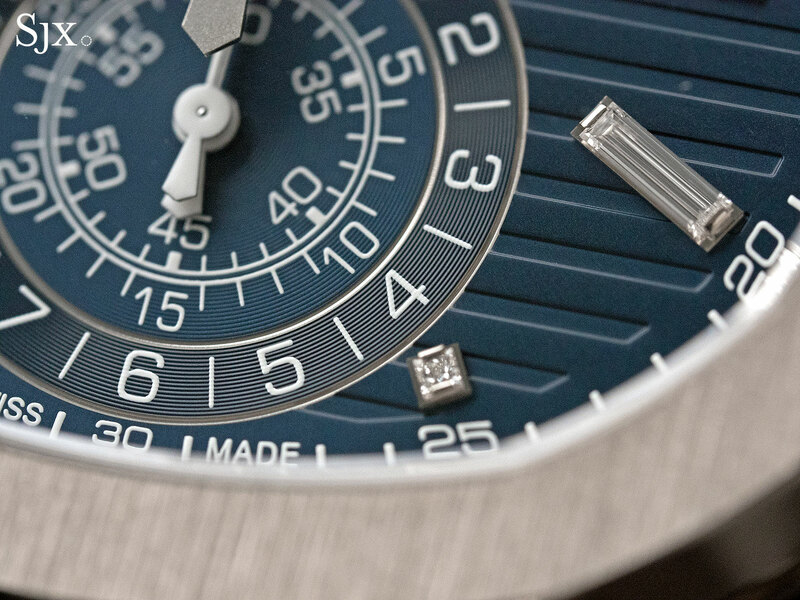 Despite being relatively large, the anniversary lettering on the dial recedes into the background because it is exactly the same colour as the dial. Even the baguette diamond markers are subtle, being set on white gold mounts. On the wrist the diamonds aren’t especially obvious. From the back the view is exactly the same as that on the steel Nautilus, with the same calibre 324 SC inside. Only the precious metal hallmarks on each corner of the back give the game away. 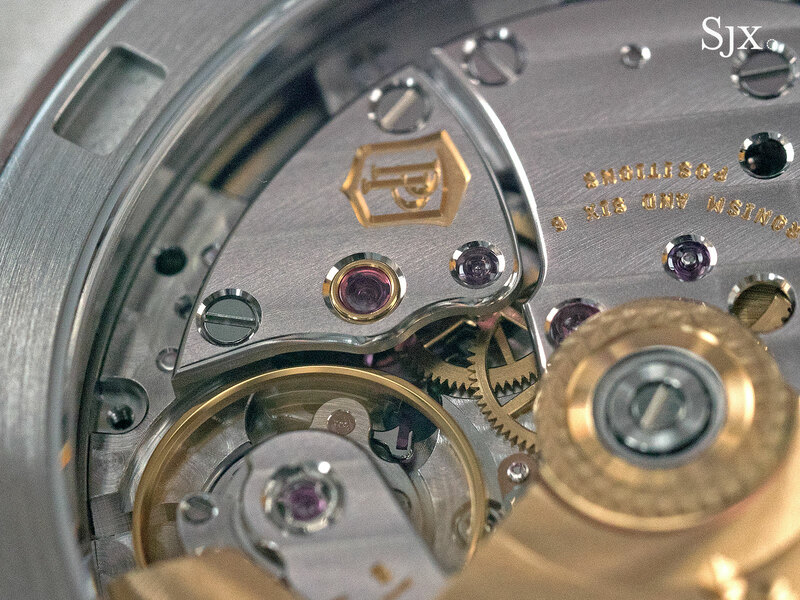 While well made and finished, this is a fairly ordinary movement for a watch this expensive, especially one meant to commemorate a significant event. 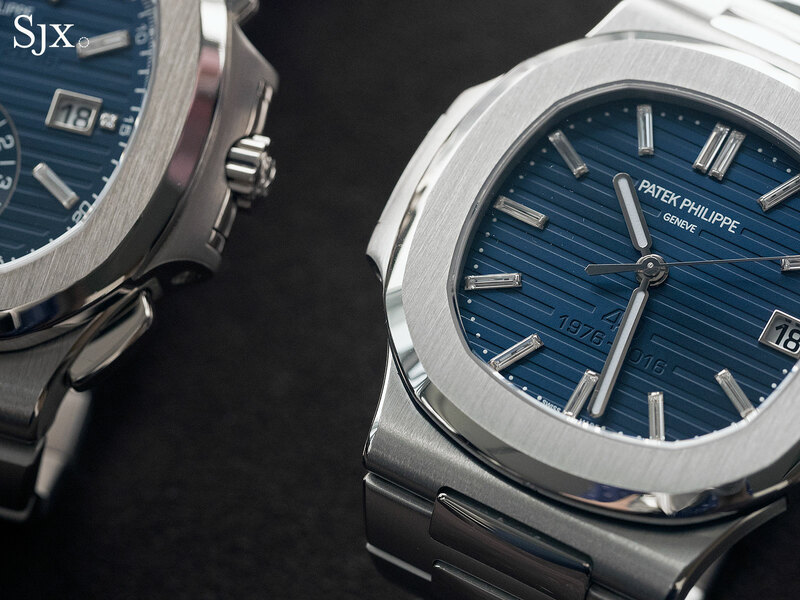 The watch is similar enough to the ordinary Nautilus as to make it conservative, even boring, which should please traditionalists. 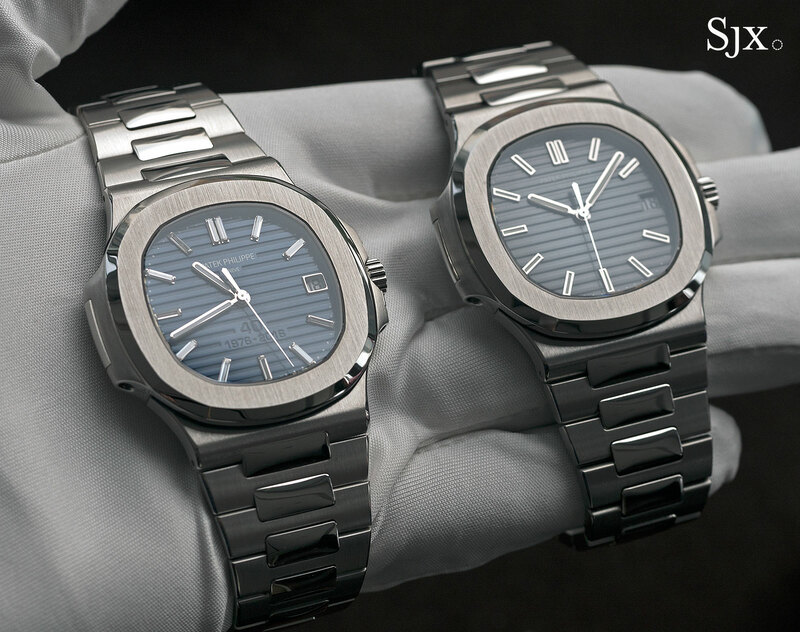 Lay it side by side with the steel Nautilus automatic and the visual differences are immediately apparent, but not significant. 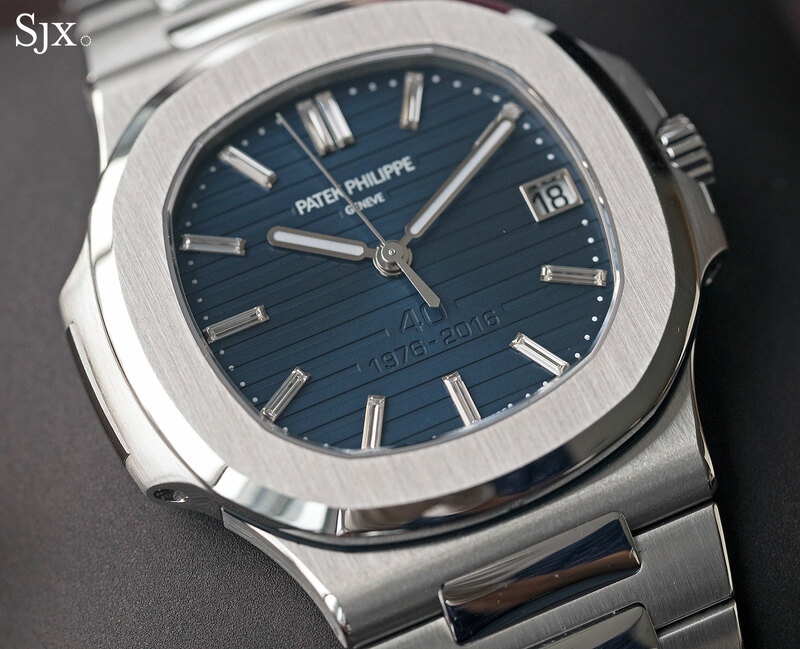 In fact, the platinum anniversary Nautilus is almost identical to the special edition platinum Nautilus that was made in small quantities for special clients in recent years. The case and bracelet are identical, as is the dial colour. 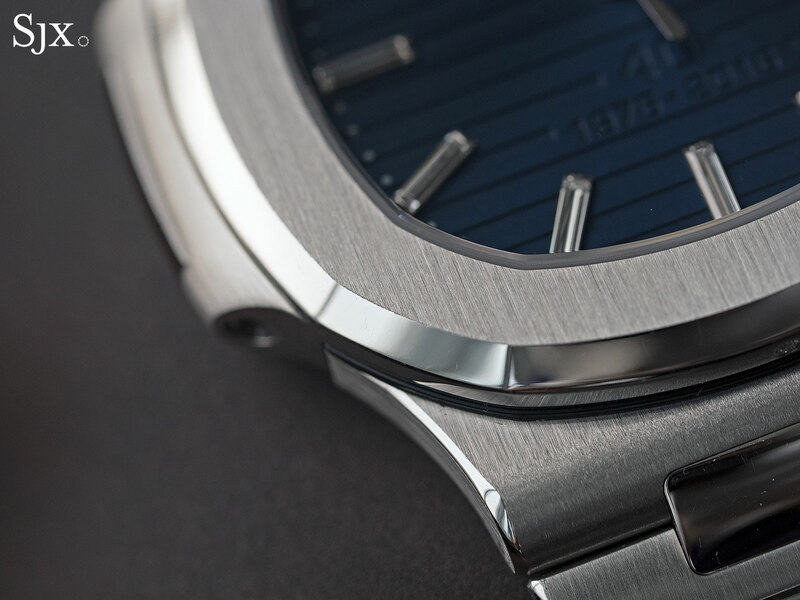 Despite everything, the platinum Nautilus is an easy watch to like. The second anniversary watch is the less traditional of the two, primarily because it is big. 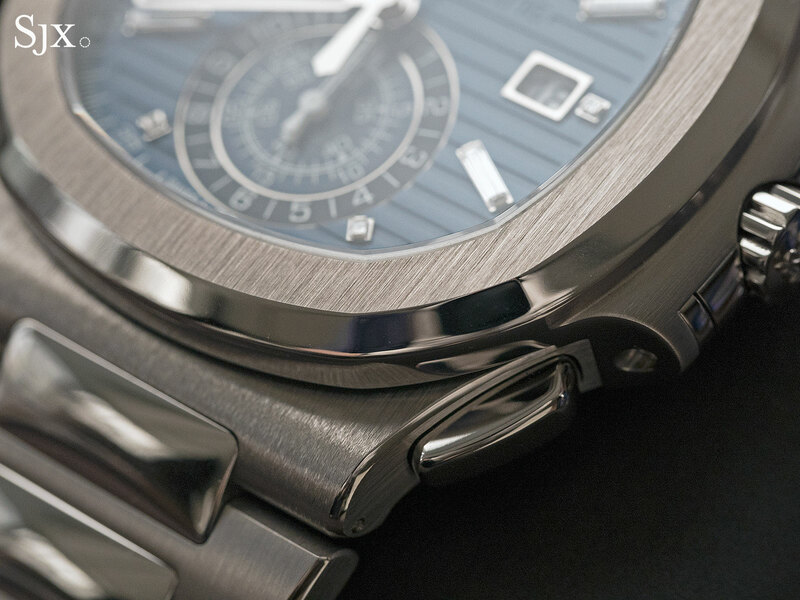 While not as large as widely reported, the Nautilus Chronograph Ref. 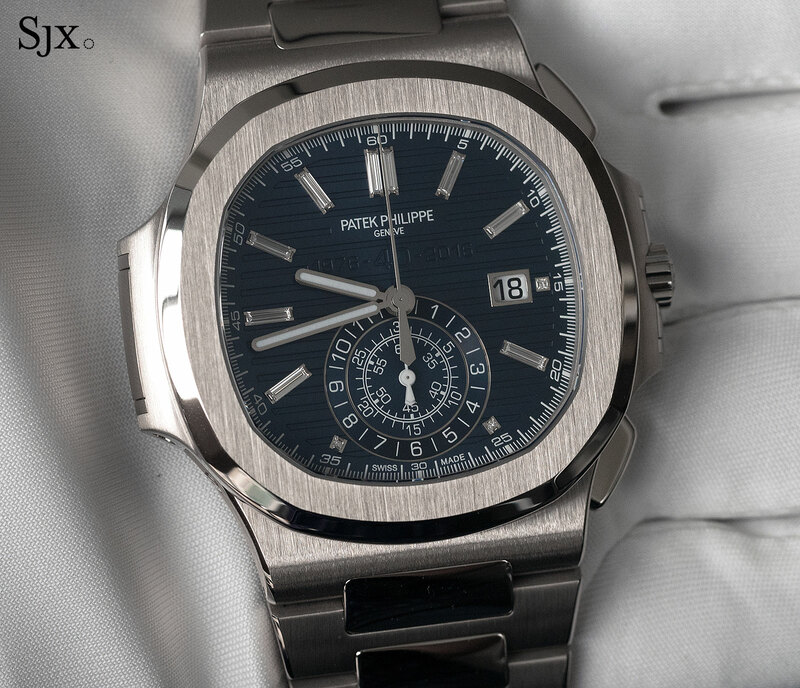 5976/1G 40th Anniversary Limited Edition is probably the largest watch in Patek Philippe’s current line-up. To set the record straight, the case is 44mm diagonally from one edge of the bezel to another (from 10 o’clock to four o’clock), big but not gargantuan; the ordinary Nautilus chronograph is 40.5mm measured the same way. 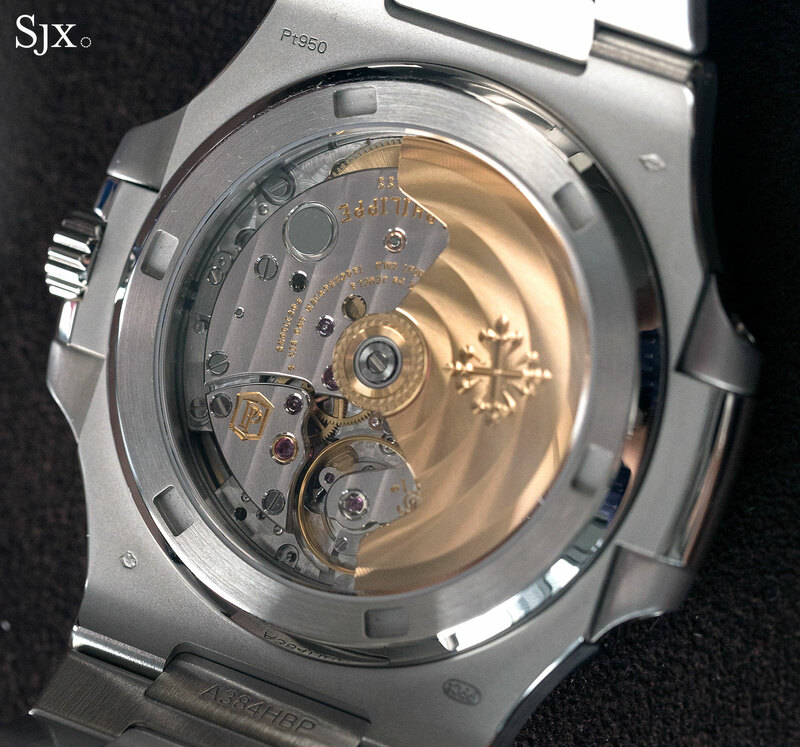 Including the crown and “ears” of the case brings the diameter to just over 49mm, resulting in the misconception that the watch is gigantic. 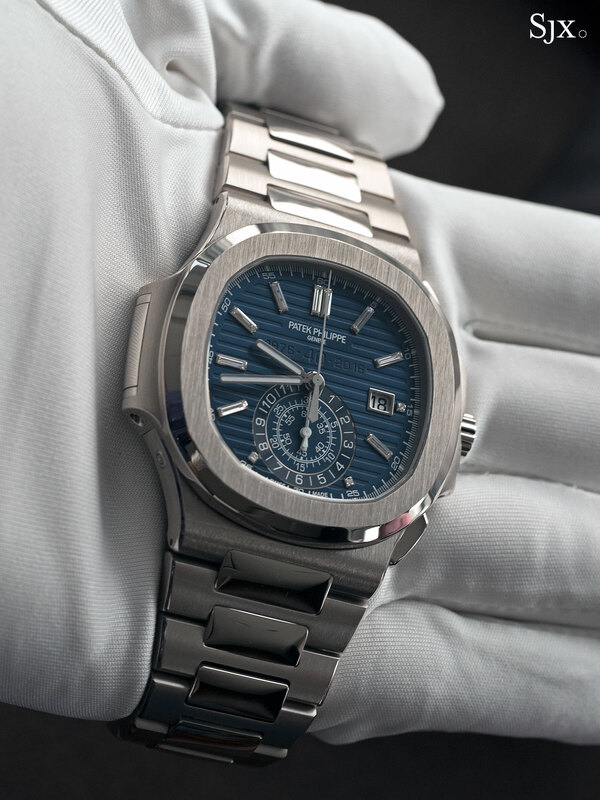 While this is incongruous with Patek Philippe in general, since the brand is best known for slimly built watches, the new Nautilus Chronograph is not remarkably large compared to rivals like the Audemars Piguet Royal Oak Offshore. And despite the watch being noticeable because of the size, it is not especially flashy. Neither the dial nor the diamond markers are especially outstanding. Unexpectedly, however, the case is slimmer on the extra-large anniversary model than it is on the ordinary chronograph. 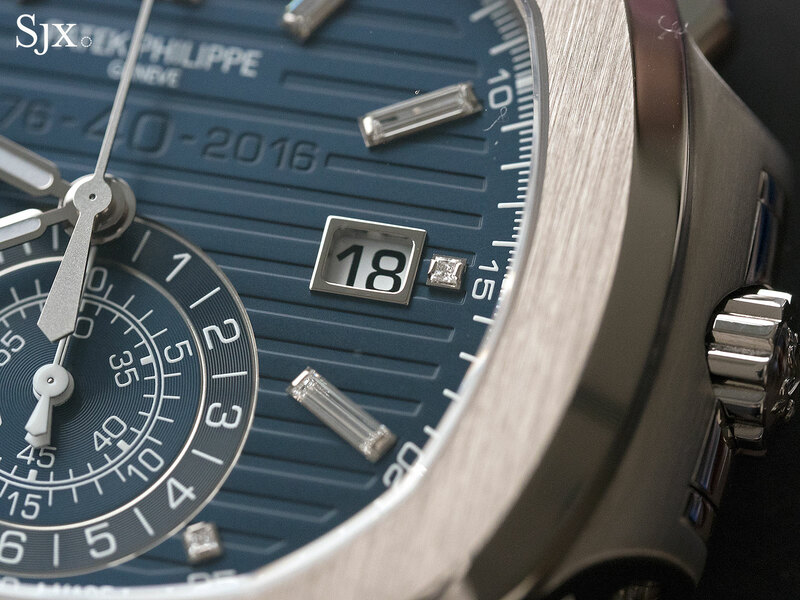 While the regular model is 12.6mm high, the anniversary Nautilus Chronograph is 12.16mm. 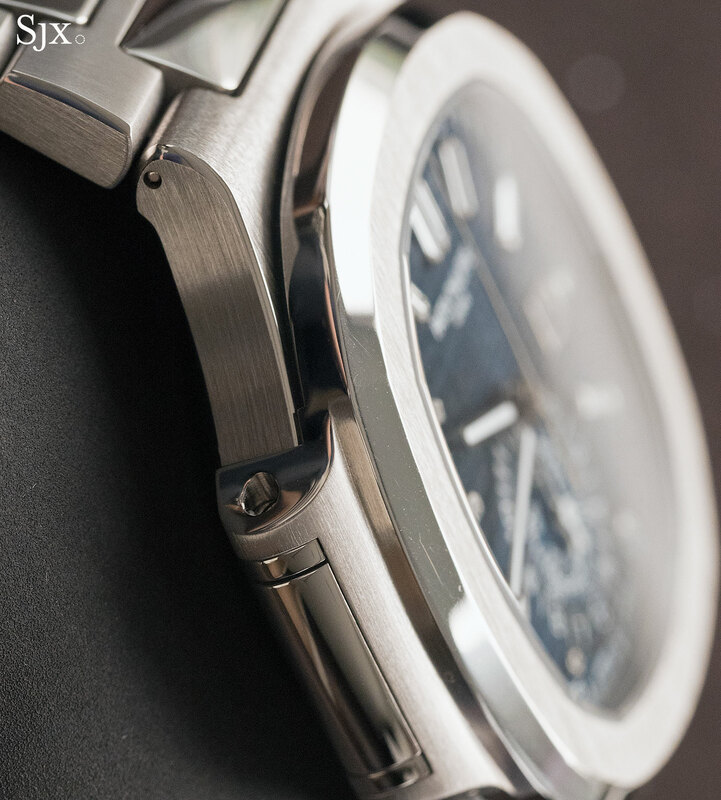 While that’s barely perceptible, the wider case diameter reduces the perceived height of the case so the anniversary chronograph feels slimmer than such a watch typically does. 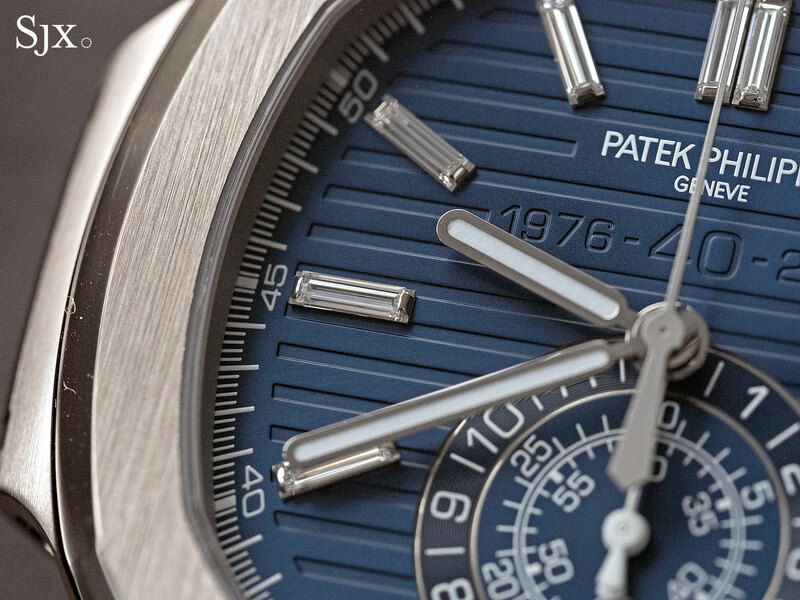 While imposing and heavy, suitably so for a watch of this genre, the Nautilus Chronograph lacks the elegant, precious feel of the platinum ref. 5711/1P. And the white gold case has a noticeably different colour from platinum, being slightly more grey with a faint hint of yellow, the natural look of white gold. 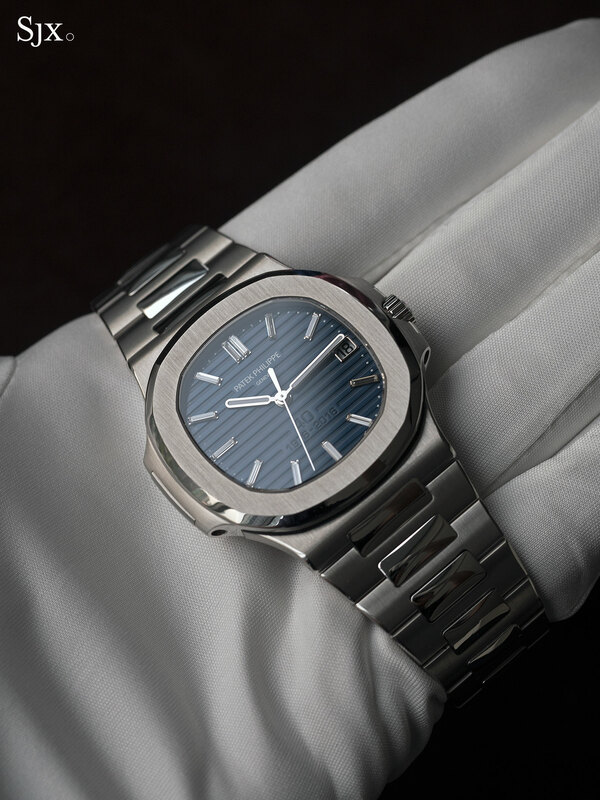 Nonetheless the case is finished as carefully as on the platinum watch, with finely brushed surfaces and mirror-polished bevels intersected by neat borders. 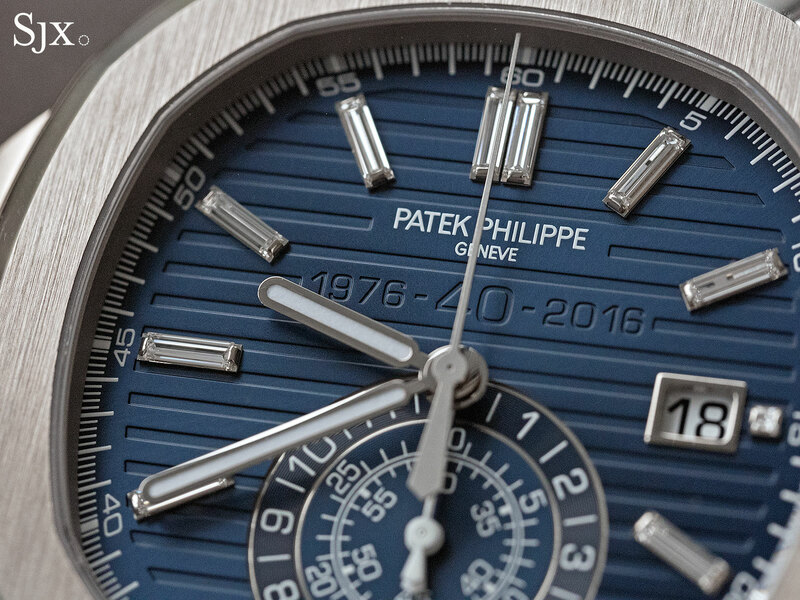 The chronograph dial looks good in the metal, with the anniversary lettering even less obvious than on the platinum Nautilus. 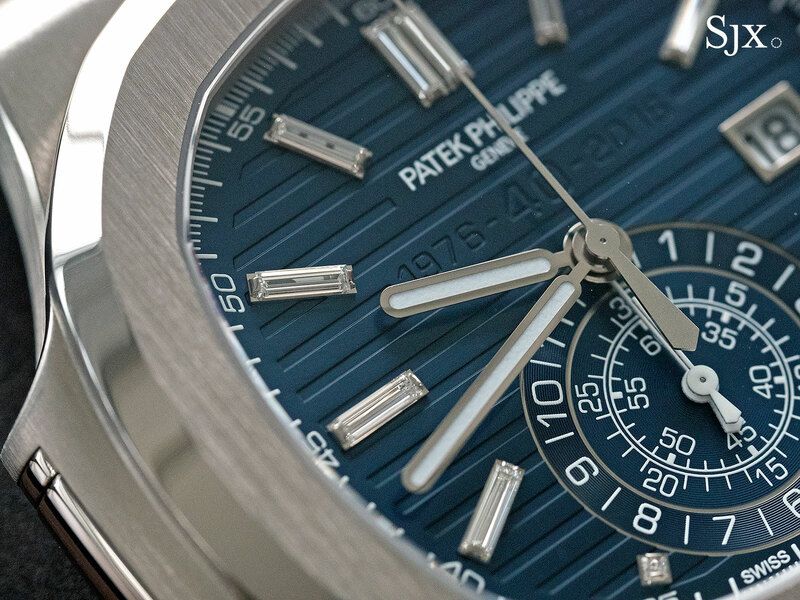 Because the dial is large and busy, with the chronograph sub-dial at six o’clock being the centre of attention, the stamped text is forgettable. That being said, the stamped text makes little sense, reading “1976 – 40 – 2016”, which will irk a semantic pedant. 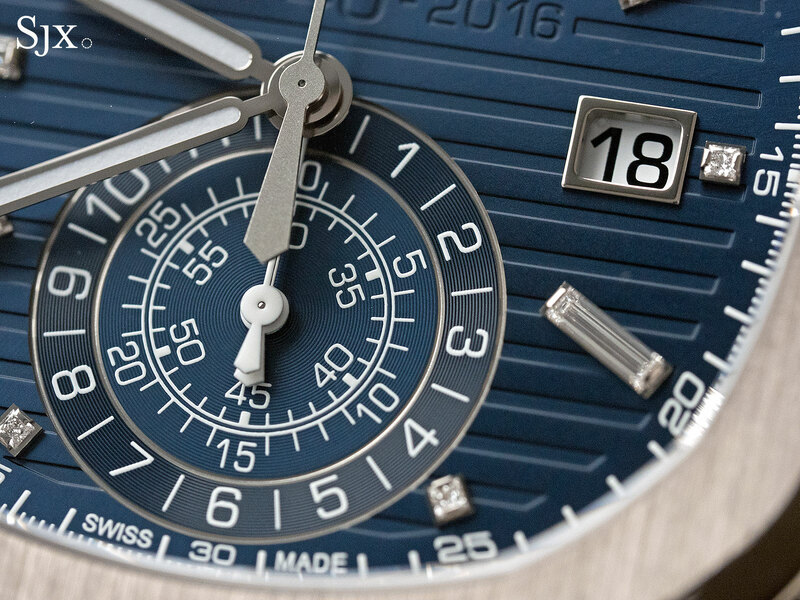 Though not at all apparent at a distance, the dial is actually more than one shade of blue, because the chronograph register is in two different tones, with a darker blue for the hours and a lighter one for the minutes. 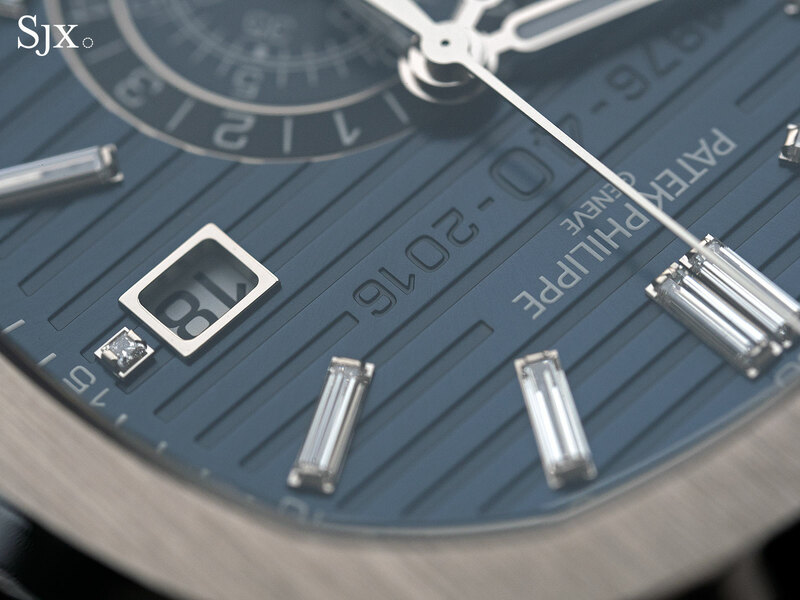 Distinguishing between the elapsed hours and minute counters that co-axial on the same sub-dial is a useful design feature, though the blues used are so similar the different is minute. 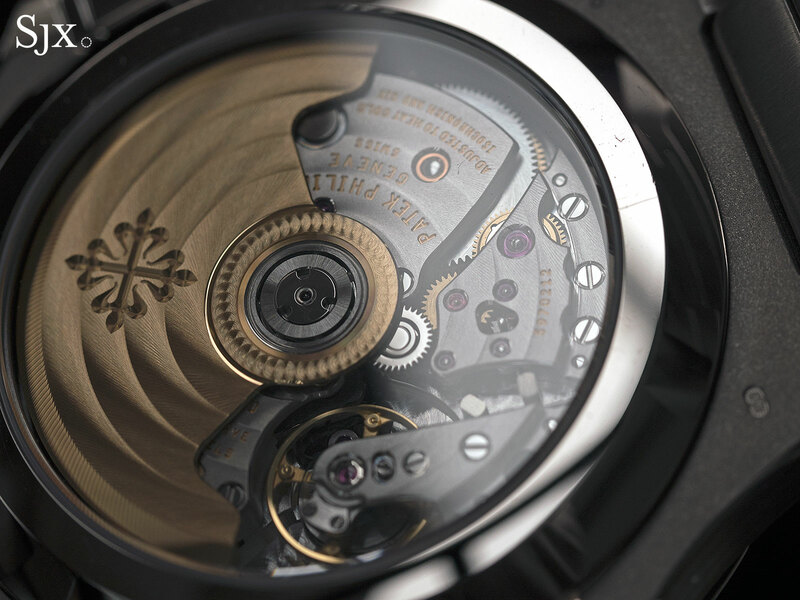 Mechanically the calibre CH 28-520 C movement inside is identical to that found in the Nautilus Chronograph ref. 5980. 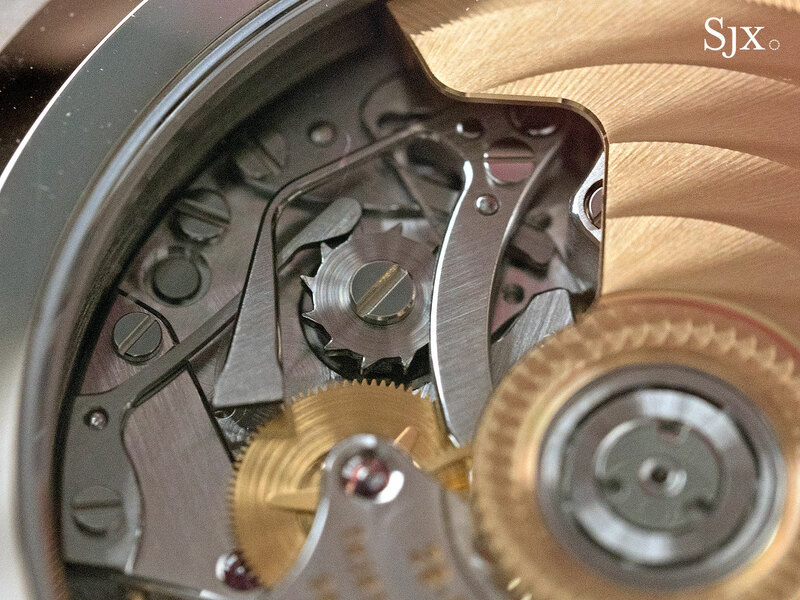 It’s self-winding with a flyback function, as well as the usual features of a modern, mid- to high-end chronograph, namely a column wheel and vertical clutch. 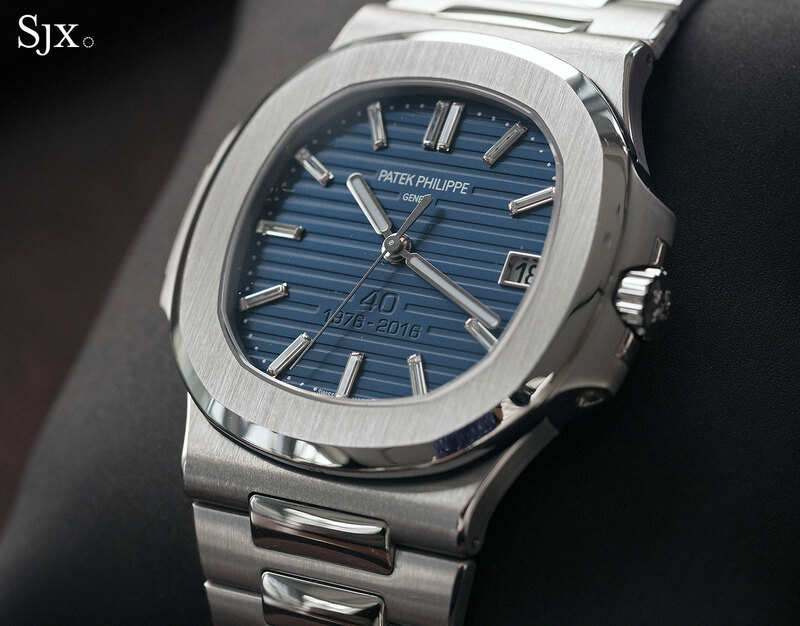 Limited to 700 pieces, the Nautilus ref. 5711/1P-001 costs SFr100,000 or S$149,300. 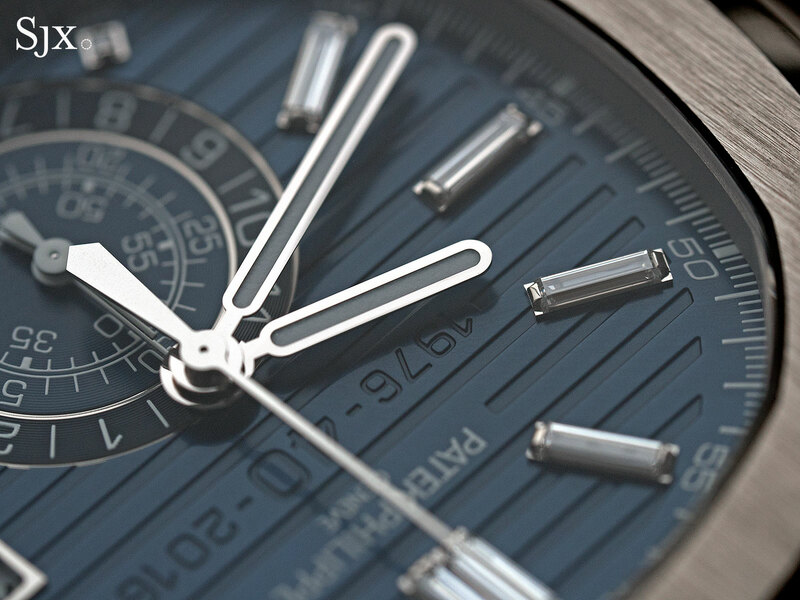 The Nautilus Chronograph ref. 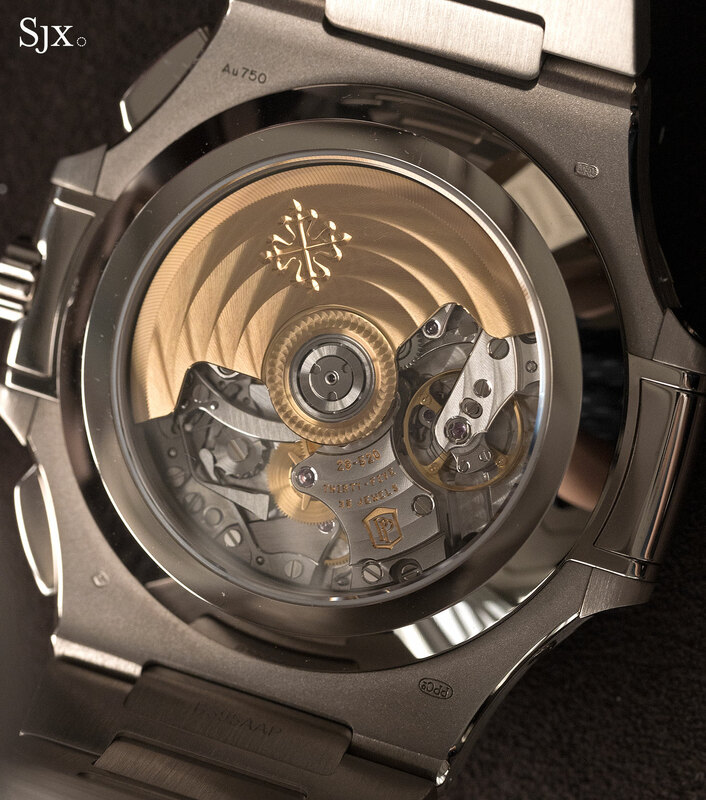 5976/1G-001 is a limited edition of 1300 watches, priced at SFr85,000 or S$127,000. 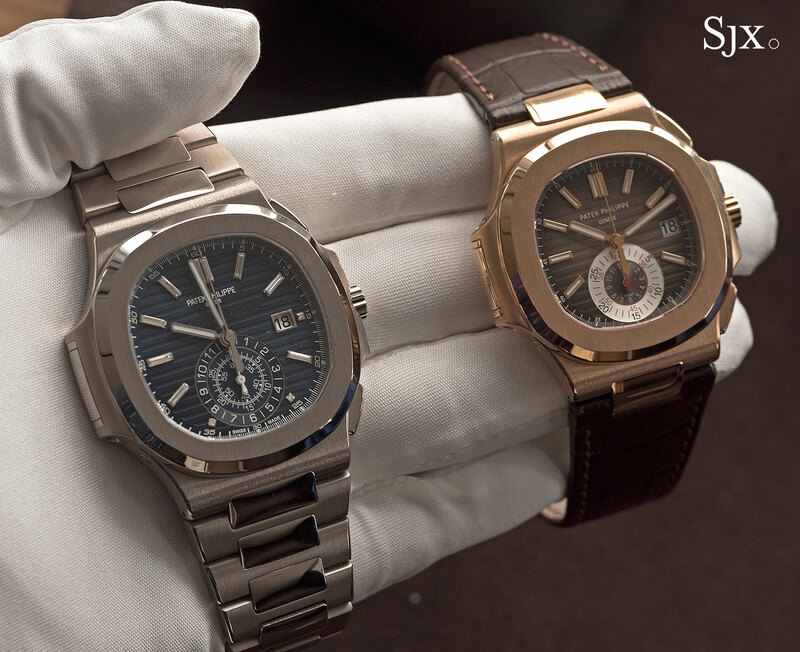 Both watches are available from Patek Philippe retailers and boutiques, with the editions being delivered gradually over 2016 and 2017. Correction 25 October, 2016: First generation Nautilus chronograph should be ref. 5980R, and not 5960R as previously captioned.